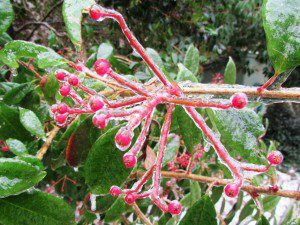 Yesterday the South Carolina Lowcountry endured an ice storm that made our roads treacherous, closed the airport, and shut down schools and government offices throughout the region. Bamboo was bowed down by a weight of ice near some of our gibbon enclosures. This same system wreaked havoc in many parts of the southeastern U.S., as far away as Texas, Virginia, and Florida. Our governor declared a state of emergency. The sign at the head of our driveway is not usually decorated this way! But at the IPPL sanctuary—we were prepared! We have generators (eight of ‘em, with plenty of fuel), extra containers of water (since our well uses an electric pump), lots of canned veggies for emergency rations, and (best of all) a dedicated animal care staff, who braved the treacherous roads yesterday to make sure our gibbons were OK.
A generator stands ready to power the office. Two of our caregivers, Hardy and Samantha, even spent Tuesday evening on the grounds, doing walkabouts every two hours throughout the night to check for downed limbs or other problems. Fortunately, the power stayed on despite the sleet and freezing rain. 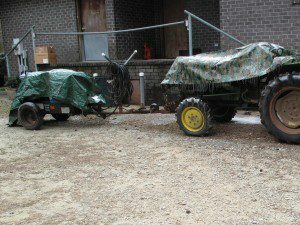 The next day, there was no snow (to the disappointment of some children we know…), but a layer of icy pellets covered the ground. 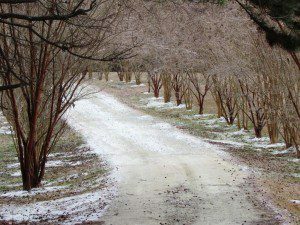 The entrance to the IPPL sanctuary was covered in icy pellets. 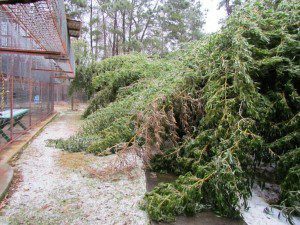 All around the sanctuary, though, the bamboo and shrubs were bowed down by a weight of ice. Individual leaves and berries were coated. 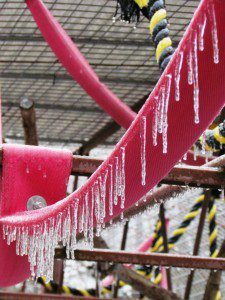 One of our gibbon hammocks drips icicles. 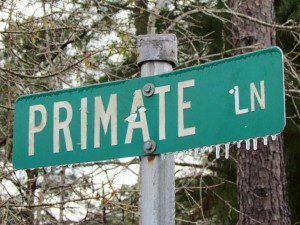 But—did you know?—icicles make a fine source of gibbon enrichment!